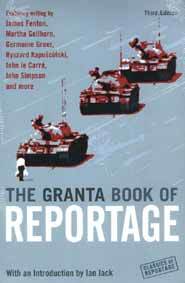 matter of the Granta Book of Reportage (ISBN 1-86207-815-7) is actually timeless, though historical in nature. Who will ever forget Tiananmen Square for example, and the image of the lone man standing in the path of the oncoming tanks is even used on the cover. There are 13 items covered in the book, and as noted by Ian Jack in the introduction, they are all too long and wordy to have been used in newspapers, but were previously published in the Granta magazine itself. Events that changed the face of history are covered including the Fall of Saigon (James Fenton), Women and Power in Cuba (Germaine Greer), Tiananmen Square (John Simpson), the Invasion of Panama (Martha Gellhorn), Mumbai (Sukhetu Mehta) and Osama’s War (Wendell Steavenson) amongst others. expressed that could be construed as “they deserved it”, but rather a relentless search for that very well hidden item called “truth”. appearance of the tanks in Tiananmen Square. It also describes the mood of the revolutionaries and how that in turn became as bloodthirsty as the actions of the tank drivers themselves. At B. 695 it is a hefty price, but the book does offer a hefty read. This is not a pick up and put down book, as much of the items are heavyweight and take some careful digesting. As could be expected from their original source, these are not cursory scribblings, but are slanted towards the academic examination. In many ways, it can be a depressing book that chronicles the animalistic atrocities that mankind metes out to other members of the human race. Irrespective of whether in the “right” or otherwise, it is obvious that we, as the inhabitants of Planet Earth, have a long way to go before we can really claim to be civilized. However, O have to say that at B. 695 I would also have expected a better quality of paper (the review copy pages were in that off-white colour usually denoting recycled pulp) and a heavier page stock. This is not a book that will last until your children are of an age to understand some of the influences in the past that have shaped today. A shame really. The subject matter deserves better. 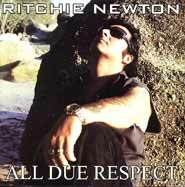 Ritchie Newton is an artist of considerable talents, who on his new album ‘All Due Respect’ shows them off with considerable style. Ritchie Newton is a resident of his beloved Koh Samui, and his feelings for his adopted home shine through on this album. All artist have influences, Ritchie Newton is no different in that respect. Robert Johnson influenced the likes of Chuck Berry and Muddy Waters, and they in turn influenced so many artists as diverse as the Beatles, to Led Zeppelin, and the Rolling Stones, they of course then influenced a whole generation to pick up a guitar and play and so on. So I mean it as a compliment when I say that although Ritchie Newton has developed his own style he also wears his influences proudly on his sleeve. Ritchie Newton was always mainly influenced by Elvis Presley, and the spirit of the great man is carried through into all of his music although by no means dominating it. In fact, over the course of the eleven songs on this album the influences that surge to the forefront are many fold, from the west coast sound of Steve Miller on opening number ‘After The Last Eagle Flown’ to the blue collar rock of say a John Cougar Mellencamp, or Bruce Springsteen on several of the early songs, to the soft balladeers of the early fifties, in contrast the album concludes with a storming hard rock number ‘King Of The Night’ which could be straight off a Judas Priest album. There is also a fine tribute to death itself, ‘The Last Goodbye’ and the many ways it has to be dealt with, when somebody who means a lot to you dies, but how also life needs to go on. The words are worth printing to put Ritchie Newton’s feelings across. “I remember when my darling finally said goodbye. She was my love, my inspiration, she was everything to me. She gave me a hard lesson on treating people you love. Today we are best of friends and we will never say goodbye. The deepest cut in life is the last goodbye”. All of the music on this album is original compositions, except for an emotional run through of Van Morrison’s ‘Sometimes We Cry’ which Ritchie Newton interprets with a fine spoken / sung version. A great reading of a great man’s song. On other songs Ritchie Newton gives co-song writing credits to his friends from Koh Samui. Perhaps in the middle the songs become a little awash in emotion stretching the listeners taste in music a little too far, but then it does give Ritchie Newton a chance to show the full range of his talents. But I think he should stay as the saying goes a little bit country and a little bit Rock ‘n’ Roll with a foot firmly placed in both camps without going too far into the emotional balladry. Ritchie Newton is no newcomer to the recording studio, this being his fifth album release. The first two being from his native Germany, ‘Bad To The Bone’ (1994) and ‘Suchtig’ (1996), both recorded by a slightly different Ritchie Newton that we know today. On the cover of each album you get a long haired Ritchie dressed in leather and chains glaring out at the world in defiance, and all the songs are of a very hard rock nature. In 1997 Ritchie Newton came to Thailand and like so many people fell in love with the country and its beautiful people, almost immediately deciding to live here. It was obvious that a living was not going to be made as a long haired rocker, so a complete change of image was required and a living as an Elvis Presley impersonator was eked out. At first Ritchie did not exactly earn a fortune, but valuable experience was earned the hard way, and the word soon spread about the young man with the amazing voice. In 1999 Ritchie met Thailand’s number one Elvis impersonator Jaruk Viriyakit who unselfishly invited the young man to join him on stage on one of his shows, which was later shown on national TV. This was just the helping hand up the ladder that Ritchie Newton needed. Soon, Elvis Ritchie Newton was not only performing all over Thailand, but Asia and Europe as well. During this time Ritchie was blessed with having his first son, Rino Mangon, which perhaps helped to quieten down the wild rebel in him. There also followed two very popular Elvis tribute albums: one a studio album in (2002) and a Live album (2004) both recorded in Koh Samui. But it is now with the release of ‘All Due Respect’ (2005) that Ritchie has really come into his own. The songs are very strong with perhaps ‘I Lost My Faith In You’ being the centrepiece and stand- out track on the album, but throughout Ritchie’s exuberant character bursts through. Ritchie Newton is by no means a selfish man, and although there is no doubt that this is Ritchie’s album, there is still plenty of space for Ritchie’s fellow musicians to shine. The piano, keyboard and bass work of Carlito ‘Lito’ Vidal is an invaluable addition to the Newton sound, Grathor lays down a solid rhythm section behind the drum kit, with Caesar F. ‘Jon Jon’ Miranda Jr chugging away on acoustic guitars. The backing vocals of Viva Vinson and Diane Jane are stunning, particularly when they step up to the spotlight and duet with Ritchie Newton. To top this off is some sterling lead guitar work by Boonyarit ‘Noise’ Chaichana, who really rips up the six strings when the opportunity arises. This lot must be amazing in concert. The album was produced by Ritchie Newton himself at the Sonic Arts Studio, Lamai Beach, Koh Samui, Thailand. To produce an album of this fine quality they must be very fine studios indeed.